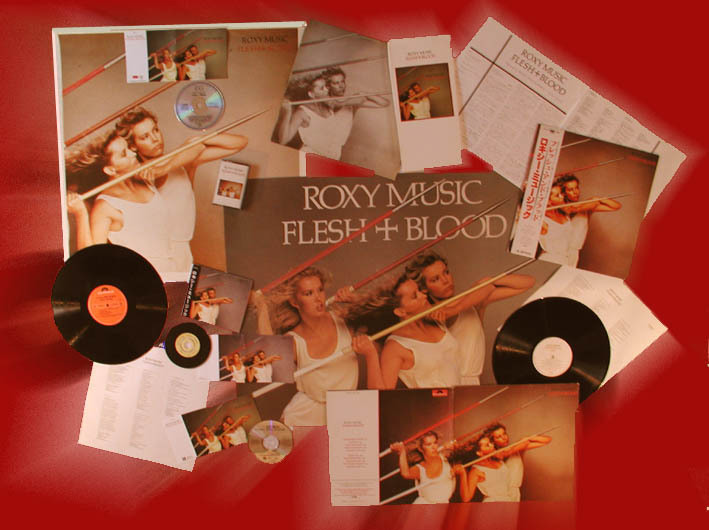 Roxy Music's seventh studio album was released on 23rd May 1980 and was in the UK album charts for 60 weeks reaching the number 1 spot on 28th June 1980 for 1 week then again for another 3 weeks on 23rd August. The album saw for the first time on a Roxy Music album, two cover versions. Wilson Picket's 'In The Midnight Hour' and The Byrds 'Eight Miles High'. Lover This Ferry/Manzanera song was used as the b-side to the 'Same Old Scene' single. Bryan Ferry Vocals And Keyboards On "In The Midnight Hour", Vocals And Piano On "Oh Yeah", Vocals And Keyboards On "Same Old Scene", Vocals Synthesizer And Guitar On "Flesh And Blood", Vocals Piano And Strings on "My Only Love", Vocals And Keyboards On "Over You", Vocals And Keyboards on "Eight Miles High", Vocals And Keyboards On "Rain Rain Rain", Vocals And Keyboards On "No Strange Delight", Vocals And Piano On "Running Wild"
Phil Manzanera Guitar On "In The Midnight Hour", Lead Guitar On "Oh Yeah", Guitar On "Same Old Scene", Lead Guitar On "My Only Love", Guitars And Bass On "Over You", Lead Guitar On "Eight Miles High", Guitar On "No Strange Delight", Lead And Rhythm Guitars On "Running Wild"
Andy Mackay Sax On "In The Midnight Hour", "Oh Yeah", "Same Old Scene", "My Only Love", "Over You", "Eight Miles High", "Rain Rain Rain", Oboe On "No Strange Delight", Sax On "Running Wild"
Alan Spenner Bass On "Same Old Scene", "Flesh And Blood", "My Only Love", "Rain Rain Rain", "Running Wild"
Neil Jason Bass on "Oh Yeah", "Eight Miles High", "No Strange Delight"
Allan Schwartzberg Drums On "In The Midnight Hour", "Oh Yeah", "Same Old Scene", "Flesh And Blood", Percussion On "My Only Love", Drums On "Over You", "Eight Miles High", "Rain Rain Rain", "No Strange Delight", "Running Wild"
Neil Hubbard Guitar On "In The Midnight Hour", Rhythm Guitar On On "Oh Yeah", Guitar On "My Only Love", Guitar On "Eight Miles High", Guitar On "Rain Rain Rain", Rhythm Guitar On "Running Wild"
Paul Carrack Strings On "Oh Yeah", Organ And Piano On "Running Wild"
Simon Phillips Percussion On "My Only Love"
Andy Newmark Drums On "My Only Love"Over You"